Building a chicken coop has a lot in common with building a house. It’s a good way to hone your carpentry and do-it-yourself skills. You might be surprised at the range of skills required. Before you start, you will need to understand what skills you will need, and then practice them so that your coop will stand the test of time. We have taken a full-blown chicken coop and singled out the skills you need to develop to build one. Work through them one-by-one, and jot down any skills you are particularly rusty at or just don’t know at all. You will need to consider two areas: the coop itself, and the outside run for the chickens. The old saying of “measure twice, cut once” applies here. You won’t need a formal blueprint, but a good sketch with measurements written in will guide you. Allow at least two square feet of indoor space for each bird, and four square feet outside, again for each bird. You’ll need to plan for shade. Also, make sure the coop is raised about two feet to allow for collecting droppings. Setting posts will provide anchors for stretching wire around the run. You will need to know how to dig post holes, pour concrete, and place a post so that it is vertical. Make sure you know how to handle a post-hole digger, either manual or powered. You’ll need some expertise in mixing and pouring concrete. Setting a vertical post will require some familiarity with using a level. It’s important to know how to put up the supports for the floor and lay the flooring boards. You caught a break on this project because the floor just has to be functional, not pretty. But you do have one tricky part to think about. The back one quarter or so of the floor should be chicken wire only because that is where the droppings will fall through. It’s a skillset all to itself. 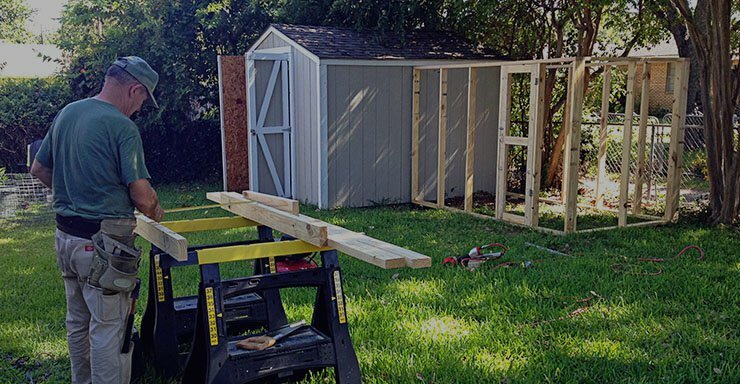 You will need to develop some framing skills to put up the skeleton of your coop. Many framers build the frame walls lying on the ground and them stand them up to attach them to the structure. You can, instead, build the frame by nailing boards to the posts. This can be difficult if you are working alone. Someone will have to hold up the loose end of the board while you nail one end. Either way, study framing before you start. Build up your knowledge and skill so your coop won’t resemble the Leaning Tower of Pisa instead of a house. A simple, slanted roof will do, so make the back wall shorter than the front wall. You’ll need to know how to install roofing supports. As you learn, you may come across words like “gables,” “trusses” and “rafters,” but for a small project like a coop, simple support joists will do. You’ll need boards, such as 1X6s or 1X8s, nailed over on top of the joists, running the direction of the slant, and those will need to be covered with tar paper. A corrugated tin roof usually works well for this type of shed, so you will need to know how to install it over the tar paper. For exterior siding, you may need to add to the framing so you will have places to nail the siding. Use your level to make the boards straight. A roosting bar should be placed along the back wall. This should look like a shelf. So, you will need to know how to put up shelf supports. Across the front wall, create some nesting boxes (one 12-inch box for every four hens). This can be a simple shelf with dividers. You will need to know how to put up chicken wire. You must first connect your posts with 2X4s nailed across the top of the posts, making a frame for the chicken wire. You should miter the joints where the 2X4s meet to make a neat corner. Extend fencing a foot down into the ground. That means you will need to know how to operate a trench digger. You can rent one from a tool company. Once your trench has been dug around the perimeter, and your fencing frame is complete, you can put the wire in place. That means you will learn how to use chicken-wire staples. You’ll need to use a wire stretcher to make the fencing taut across the fence framing. You will need to build a gate using 2X4s. Put a diagonal cross brace in the frame. Then cover with chicken wire. Hang it with hinges. You will need posts where the gate hangs for the hinges on one side and the latch on the other. So, you know what skills you need, but how do you build them up? You’ll need to learn by doing, but that doesn’t mean you have to learn by trial and error. Take each skill in an orderly manner and learn about it. Use a guide to get the basics down, then practice each one. For skills like using a miter box, you can practice on short lengths of boards. Using a level to make a post straight is simple when you see how it is done. Once you understand how to nail floor supports in place, you know how to put up roof joists. Firming up corners of your frames with L brackets, sometimes called corner braces, makes perfect sense the first time you do one. You can learn to place supports for shelves in a few minutes. Skills like mixing concrete and stretching wire are hard to practice, so make sure you understand the idea before you start actually performing the task. Handling tar paper and corrugated tin is learn-as-you-go skills. Some general skills you will need including how to use a sawhorse (to hold up the other end when nailing a horizontal board), and figuring the length of a board that will fit within support boards on either end (subtract the width of the support boards from the length of your cross board). Using power tools requires some serious safety guidelines. You will also find the need to know how to start a nail before you first place a board where you want it so you will have one hand free to hold the board up. No single skill for building a chicken coop will overwhelm you. The trick is that you need to understand all of the skills together before you start. You can lose momentum if you stop at every stage and learn the next skill. Use our list to organize the skills and you will have an easier time mastering them. Learn your skills before you buy your supplies, because some of them, such as creating a plan, will determine what supplies you want. As you can see, the idea is to plan ahead for everything. From laying out space you want to use to hang the gate, know each skill you will need along the way. A chicken coop is an excellent way to learn the techniques you will need for larger structures. Evaluate your finished coop, and make note of any areas you would like to improve in. You’ll be on your way to tackling advanced carpentry skills.